The political weather has been stormy of late, and as the sun has come out to play at last, the garden seems the safest place to be. There’s a lot to be done to get it ready for the growing season, so time spent outside is never wasted. A lot of what I’m doing at the moment could best be termed ungardening, clearing out the contents from last year’s containers, and reusing the potting compost in the bottom of new pots, or as a soil improving mulch. The Chinese artichokes are gone – we never ate any of them – and the Jerusalem artichokes are too, because they’re just too darned wind-inducing. The oca that I grew in containers had done a disappearing act and saved me the trouble of throwing it out, too; space is reserved for properly productive vegetables this year! After the trauma of having the fence replaced, I cheered myself up by ordering two new fruit plants. 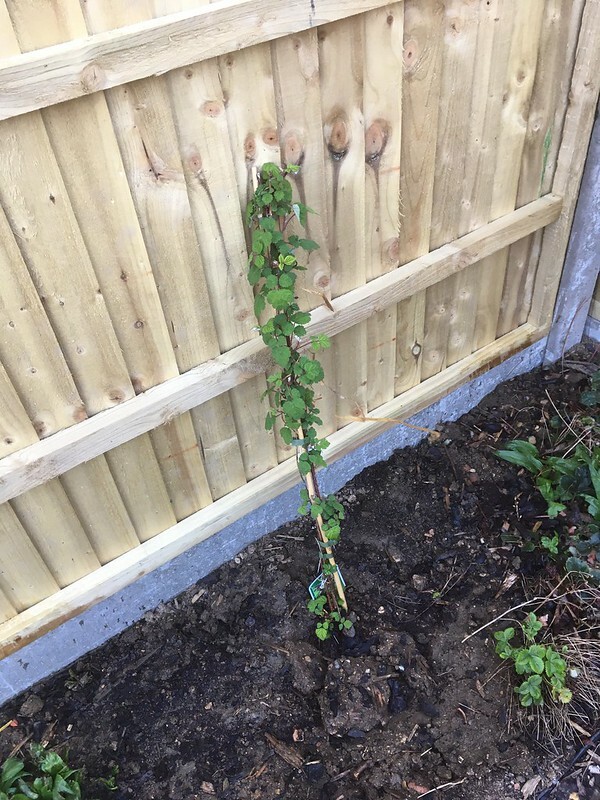 The first is another Japanese wineberry; I brutally pruned mine back to make life easier for the workmen, and then regretted it because they fruit on year-old canes. Buying a new plant probably still won’t mean we’ll get fruit this year, but it will mean a bumper harvest in 2020, and they were one of our garden favourites last year. The new wineberry is replacing the Morello cherry that we removed from the garden and guerilla planted in the hedge, because it was basically only feeding the birds anyway. The wineberry is on the back garden side of the fence. 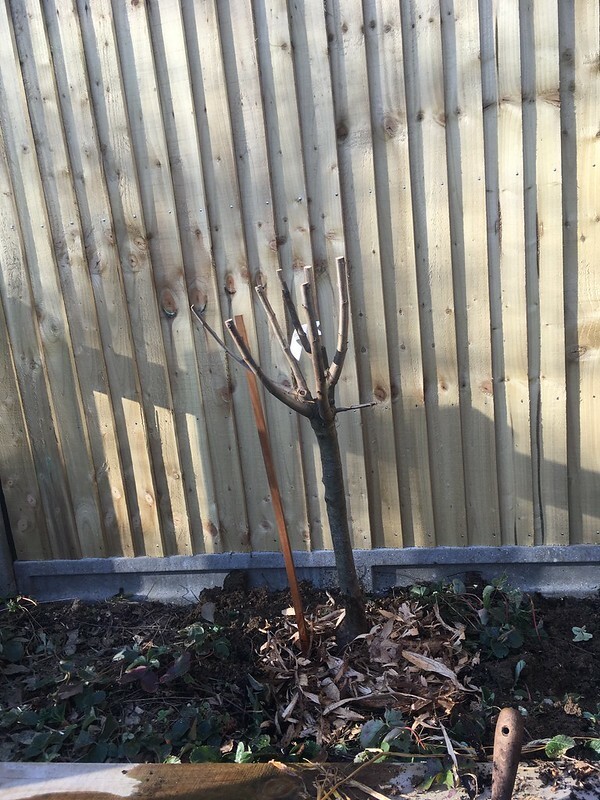 On the front garden side, I’ve planted a new ‘Czar’ plum. 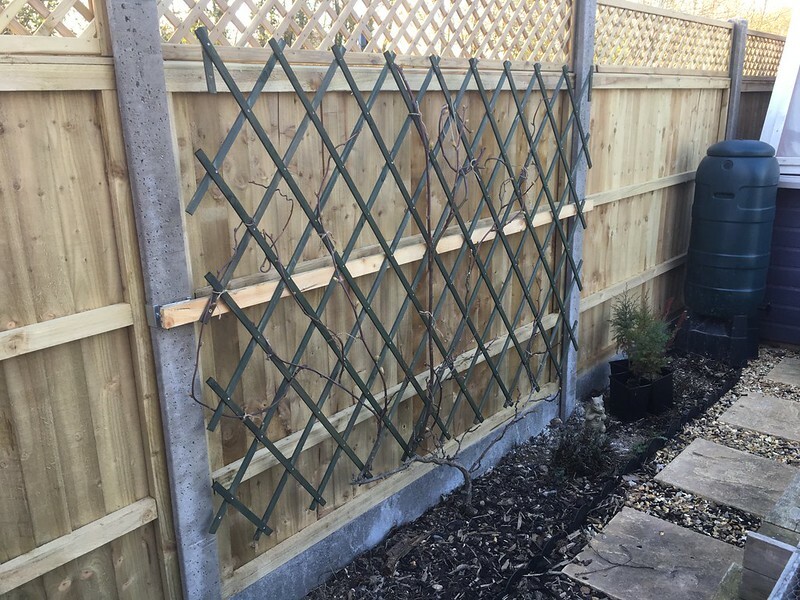 My original thought was that I’d fan train it on the fence, but it has arrived looking rather robust and established, so I will just let it bush out over the rhubarb instead. We like plums, and hopefully the birds will be happy with the hedge cherries and leave the plums alone! But again, that’s fruit for the future, not 2019. The next stage of the garden transformation is waiting for lavender shed to go to its new home, but with the sun shining it’s hard not to mentally plan ahead, because once the shed is gone, and the groundworks are complete, and Ryan has ordered and assembled his new workshop… when all of that is done (hopefully it will be quicker than it sounds!) then the space where lavender shed is now will become a patio. It’s properly paved, and having observed the garden for a few years now we’re pretty sure that area will be in the shade in the late afternoon, the time when we’d most like to be able to sit outside and enjoy the garden. We haven’t decided on furniture yet, that’s a way down the line (but I could go for one of these gazebos from Garden Camping), but we have a fire put and we’d love a tranquil spot for sitting, cooking and eating. It may take us a while to get there, but it will be worth it in the end! 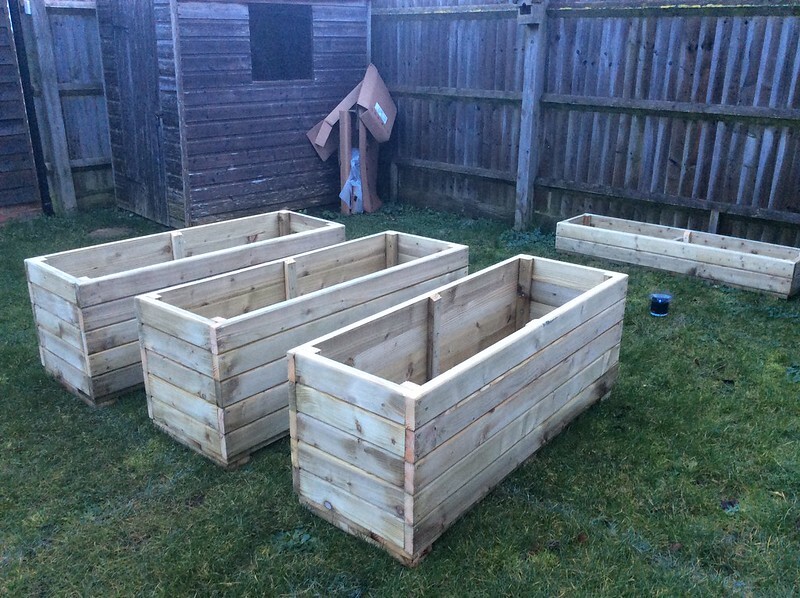 The large planters were painted and are herb troughs in the front garden; the shallow one is still naked and homeless! 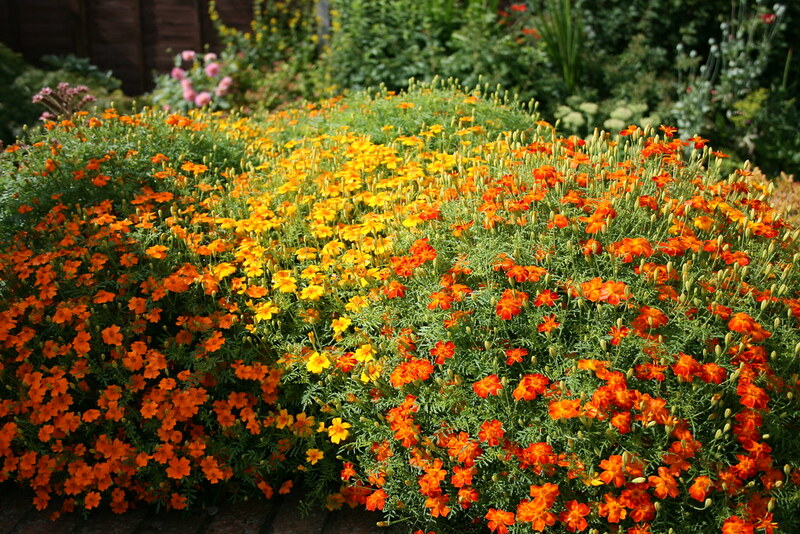 In the meantime, I’ve decided that the long, shallow wooden trough I originally bought to be a container pond will be better (at least for now) as a planter, and I have bought some sunflower (Solar Flash F1) and Tagetes (Starfire Mixed) seeds to turn it into a Bee Bar. The final placement for it is still undecided, but some pretty flowers should brighten up even the most dismal of days. This post has been produced in collaboration with Garden Camping, but the words and thoughts are (as ever) my own. Fruit for the future – I can relate to that! You must be relieved that the fencing has been completed. I like the look of those gazebos and they might solve a problem I have with no shade in the summer, until my pergola and climbers are growing up it to give us some shade. Our garden is a bit weird, because technically it’s north-facing, and yet it’s barely shady at all. Neither of us likes the heat, so in the height of the summer we don’t sit out there! Fingers cross we’re right and the shed is sitting in a corner that will be shady in the afternoon, so we can enjoy some outdoor time. A gazebo may be necessary.